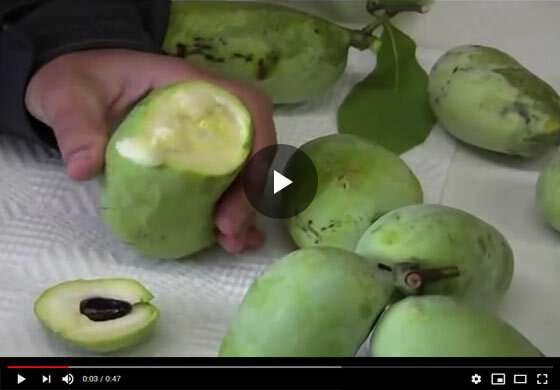 Felix from Gurney's Seed and Nursery shows off the different ways you can cut, eat and serve Pawpaw fruit. Find out how to store the fruit and learn some of the recipes you can use it in. For actually serving up the Pawpaw fresh, there are number ways to do it, depends on how clean you wanna be about eating the fruit. This is not a peel the banana in its own wrapper type of fruit. One way I like to do it is to cut it in pieces. Course I've hit the seed here. So you can see I have a piece of seed in that slice, I've got a couple of seeds in this one. Ideally, your knife would miss the seed and you'd basically have this little sliver of Pawpaw. You can cut the peel here and then just peel it off and eat that pulp and get at it, and you have a little bit of cleanliness there, but you're just gonna get messy with Pawpaws typically. So you can do these slices pass these out to your friends or serve them up on a table in those slice forms you know, pop the seed out if you want or leave them for contrast. The other way, we'll take this one here, it's a little smaller fruit, is you can just cut it into a bowl shape twist it and pull it apart and then scoop that out with a spoon. Maybe a little more regal way of eating. But you have some nice pulp color here, that yellow is what you're after, the white is a little less ripe but you see on the other pieces and then you just scoop that out, you do have to navigate your way around the seeds. But that's that's how you deal with this. It's just scooping out the pulp and eating it with a spoon. Now the other component is, if you have a big crop and you aren't gonna just eat them out of your hand, then you need to actually pulp this and basically it's the same way like you deal with an avocado and instead of one big seed in the middle you're navigating and popping out the seeds with a spoon and then scooping the pulp into a bowl and using that as a cup, you know, X number of X cups of pulp for the recipe that you're making and you can substitute Pawpaw for a banana. Any banana recipe, it, it really adds a lot to, to a recipe and, ice cream again, X cups per milk and sugar and you have your ice cream and your ice cream maker. I generally do 2 cups of pulp, 2 cups of milk or 2 cups of cream and a, and a cup of sugar for an ice cream recipe So those are some ideas of how to handle the fruit. One other point is that if you wanted to keep this in the refrigerator for a while, so you have your fruit harvested and you want to put it in the refrigerator and keep it for a week or two, it's a good idea to put this in either a brown paper pack/sack that will help after ripen it. What the fruit's doing is giving off ethylene that's part of the, that's a chemical that helps ripening process and just like, if you'd have to ripen a tomato, you pick some green tomatoes at the end of the season, you put them in a, in a bag to capture that ethylene and that will help the fruit ripen up. If you wanted to keep it and not have it ripen up quickly, a plastic bag with some holes in the refrigerator, sealed up or just in your crisper in the refrigerator and it'll hold for a while there.